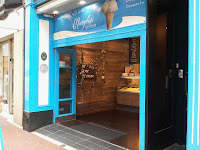 If you are among this group then let me direct you to the home of the very finest Food Allergy Free sorbet in Ireland: Murphy’s Ice Cream shops. When faced with the choice of usually two flavours (citrusy Calamansi and thoroughly rich raspberry) I HIGHLY recommend the Raspberry. It is soooo flavourful and tastes exactly like real raspberries, no glimmer of artificial anything, just pure raspberry bliss! A common misconception is that all sorbets are naturally Dairy Free. Not So. This is actually a fact that makes my heart bleed, but such is life. 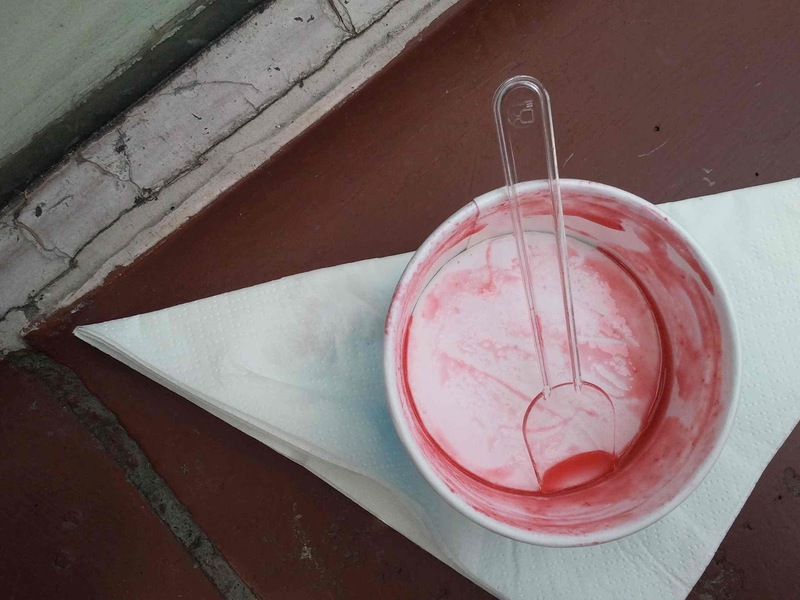 Never Assume, especially when in Italy where almost ALL sorbets are Milk ridden. 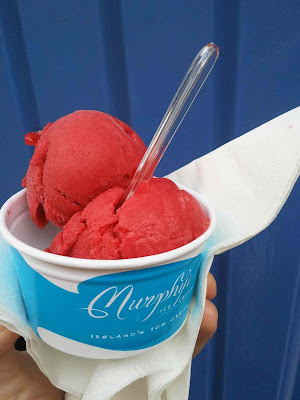 The silver lining of course, is that all of Murphy's Ice Cream shops plainly label that their sorbets are Dairy Free and when I was in Killarney I was extra pleased when the server offered to clean the serving scoop before serving due to my allergy before I could even ask! This is a company who knows that the Dairy Free world likes ice cream on a warm/sunny day just like everybody else and better yet, understands our needs. But the gold lining is that Murphy's Sorbets, in addition to being Dairy Free, are also Gluten Free and Egg Free! This is especially good news since Gino's on Grafton St stopped stocking their Soya based gelato.. sniff sniff. Murphy’s Ice Cream is also Gluten Free to boot! 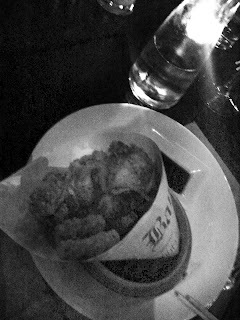 ...with the exception of flavours such as ‘Guinness’, or those containing biscuits, etc (understandably). Besides, the Dairy consuming people (namely F. and our friend A.) were all lining up for soft ice cream cones only today, October 21st, down by Dalkey's breathtaking coast line proving that everyday is good for an icy dessert! 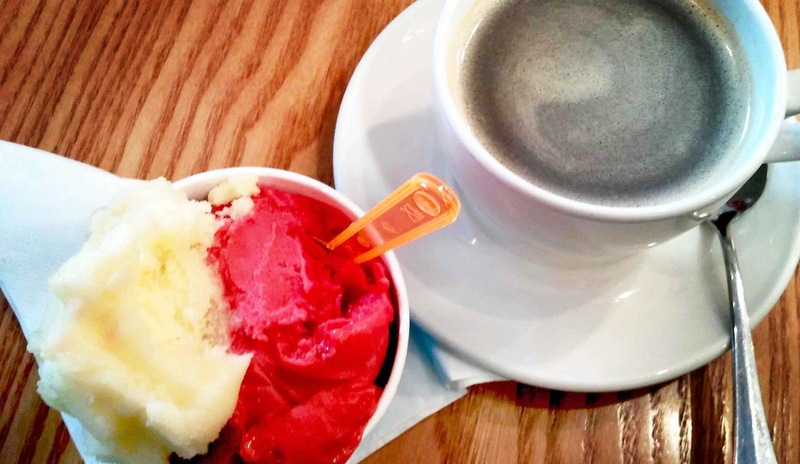 If you are tempted (as you should be) but fear the winter chill of eating iced fruit as the winds begin to howl, then I suggest having a coffee with your sorbet (Murphy's do Soya Milk too). Just the thing to warm you back up until the summer returns. Yum Yum Yum. Hello my lovely readers. I saw this little cartoon here on "Oh My Words' and thought of you or rather me...or rather my very lonely blog. I’m so sorry that I have been gone for soooo long. What can I say? Life got in the way. There’s been a few ups (new job, lots of wedding planning) a lot of downs (bereavements, and the sadness and lack of motivation that goes with it) and despite a lot of Food Allergy Friendly discoveries I’ve simply had little to no time to write because of sheer exhaustion. I have been soooo tired. BUT, Thank you for all your comments, likes and emails! I am very sorry that it has taken me so long to get back on track because I have SO much to share with you! I’ve seen lots of new products; new flavours of old favourites; amazing arrays of Dairy Free, Egg Free and Gluten Free sorbets (in every direction that I look!). There are some awesome new restaurant finds like the Bay in Clontarf that I’m dying to try out (totally Allergy Friendly and comprehensive menu!!) and some great Dairy Free, Vegetarian and Gluten Free meals in town (favourite dish of the moment is definitely the Dairy Free deep fried squid in black pepper from Saba for pescetarians and seafood lovers alike - Oh My Goodness it’s direct from Yum Town). What I wanted was a toasted sandwich with cheese and ham. What I made was a lightly toasted and fried bagel with a sunny side up corn fed free range egg, Tesco’s Italian Salami, Tesco’s Roasted Onion hummous and a grind or two of fresh black pepper. The key for me was to press down the middle of the bagel to fit the egg into neatly before toasting and to use the runny yellow egg yolk to satisfy my visual need for cheese and get my bang from the onion hummous (best hummous on the planet for sandwiches) and salami. It was simple, it was rustic and it tasted damn good. It’s already Dairy Free, and Tomato Free (and Nut Free if you can tolerate Sesame), but could easily be made Wheat Free and Gluten Free as well with a bagel substitute. Dairy Free Moroccan Cuisine in the City Centre!! I’m always Dairy Free.. no matter what test or diet or trial that I’m doing, I am ALWAYS Dairy Free because it is a genuine food allergy as opposed to an intolerance or suspected culprit. So of course I explained to the waiter my requirements and at first he proudly said that I can eat anything on the menu because ‘we don’t use any type of Dairy ingredient!’...obviously my warning lights went off and my doubtful face appeared... ‘Not even in the desserts? the ice cream? butter?...hidden ingredients?...etc etc etc ? ?’ and he confirmed NO! None at all, well except for the ice cream and desserts of course! But then it all took a big turn around because after ordering he came back to us to apologize and say that the Bastilla dishes (made with filo pastry) were brushed with butter... he was very very sorry and got us to change our order... I went with Kobiza (Fresh Leaf spinach reduced in a coriander, garlic and lemon base) to start and the Fish Tagine (Catch of the Day - Cod - marinated in sharmoulah and served with vegetables in a spicy tomato sauce) which was Amazingly beautiful!...So tender...So flavourful... and my Vegetarian F. went for a starter of Makoda (a blend of mashed potato, fresh spinach, parsley and coriander on a fruity tomato sauce) and the Vegetarian Cous Cous (A selection of fresh vegetables traditionally flavoured and served on a bed of cous cous).. And this is where the waiter went beyond the normal: He also advised against it when F. ordered a side of pita bread with his couscous dish because supposedly the two different forms of wheat can cause indigestion and bloating (who knew?!) And when serving F’s cous cous dish he said that actually there is Milk/Butter in the cous cous and so as tempting as it may be, I should not take a taste! I thanked him so much! No waiter has EVER advised me against trying somebody else’s dish when I hadn’t asked about it - It was the cherry on top for me! I know that some of you will think that that’s not good enough, and that he should have known those details beforehand but I say that yes, he should have, but now he does, he did take it seriously and was obviously in full communication with the chef. And I can tell you and pre-warn you that the couscous and the filo and all the desserts definitely contain Dairy. And remember that if something sounds too good to be true - ie: Dairy free filo pasty in a restaurant - it probably is so order something else. And now F. and I have begun the Food Allergy Friendly Venue search!! and Cake Maker Search!! All Extremely Exciting!! !